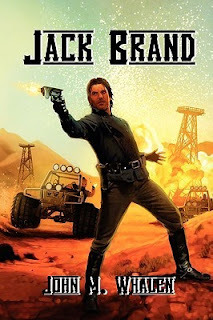 This book featuring space adventurer Jack Brand by John M. Whalen (the publication was re-titled The Big Shutdown in 2015 when the author self-published it) is a collection of space western short stories about a hired raygun-slinger and former employee of the Tulon Security Force who's finding his way on a wild and wooly planet far from Earth. The stories are tied together by a small cast of believable characters and Brand's perennial search for his kidnapped sister. It's a good set up and the full effect is that these intertwined chapters read nearly like a regular novel. Every episode offers some exciting action, though I admit, some of the scenarios can get a tad tiresome. A few of the bad guys border on the bumbling criminal stereotype and too often leave Brand a way of escape when the best solution is to simply kill him outright. (Obviously, a book's hero can't die in the first story! So the escape trope is part of the adventure.) Brand does get beat up quite a bit, though, making this fairly realistic (PG-13 for violence). Overall quite enjoyable. A few of the stories are a bit campy, however, reminding me of those sci-fi B movies from the 1950s. But if read in the spirit of pulp action and adventure, they make for some fun escapism. The writing is solid and most chapters conclude with an understated observation of the human predicament. Quick, thrilling, and at times quite thoughtful. Recommended for space opera and space western fans of all ages. 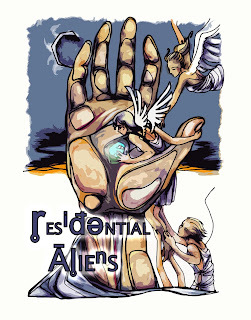 Note: This collection (many of which, if not all, were first published in an online space opera zine called Raygun Revival) was originally published simply as "Jack Brand" with this remarkable cover (above). I received a free PDF version of the book a long time ago from Pill Hill Press. 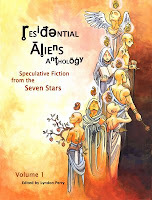 At the time, I asked fellow editor and avid spec fic reader Keanan Brand - no relation to Jack Brand! - to write a review back in 2010, which you can read on this blog here.